For yesterday’s Feast of the Immaculate Conception (transferred this year to December 9), I thought I’d check out what the Vatican offered for the occasion on its Pope App (Free). Voila, I spot at the top of “From the Pope” link a booklet for the Celebration of the Act of Veneration of the Blessed Virgin Mary. Select that link and…nothing. Just a title, but no “booklet.” Last week, I wanted to access Pope Francis’ apostolic exhortation, Evangelii Gaudium. Pope App offered a partial text ending at paragraph 11 (out of 288!). Check out the screen shot of the last page of the exhortation. Do you see how it ends mid-sentence with an ellipse? Doesn’t that leave you feeling as if someone on the other end doesn’t care whether you get the full message? I wish the developers of the Pope App (Pontifical Council for Social Communications) would give the text the same love and attention I would. I get the sense that text is inserted automatically via a computer program code and left to float somewhere in cyberspace (complete or incomplete) until the code removes it. I don’t sense a live Catholic on the other end scrutinizing the material with the devotion and respect these documents deserve, conscious that there are actual readers on the other end. Pope App used to contain the major texts of the Holy Father (eg. encyclicals, apostolic exhortations) bundled in a tidy display in a section of the main menu. We could rely on the fact that once something as important as an encyclical was up, it remained on the app in perpetuity. These days the app offers textual content on a rolling time line. After about a month, the content disappears–gradually replaced by more timely text on the calendar. In this treatment, all text is given equal weight–everything is treated as a Tweet, for heaven’s sake! I liked having the major documents left on the app because of their meat and spiritual gravitas and value in re-visiting. When these texts disappear, we have to hop on to the cumbersome Vatican web site and navigate to that one document we are looking for. 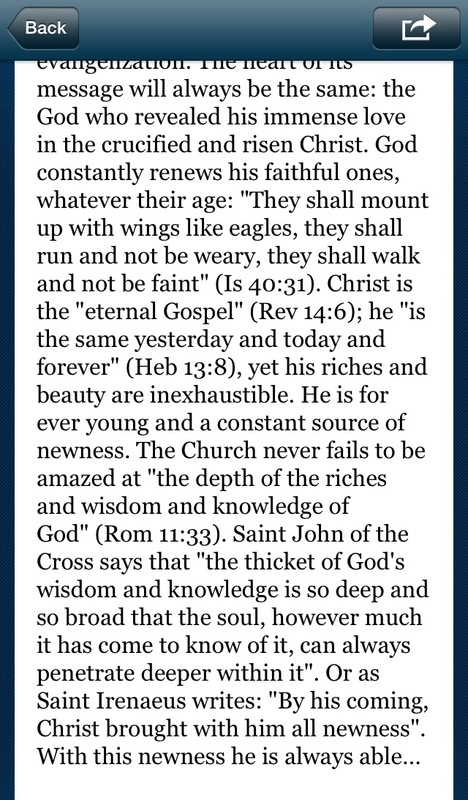 And, to make matters worse, as I pointed out, the Pope App does not always offer the text in full anyway. That being said, the app has incredibly useful features. This morning, for example, I was greeted on the home screen with a photo of Pope Francis kissing a baby; it included a reminder that I can watch him LIVE at his papal audience in just two hours. The link was right there. This pope has more messages out there than any pope in history and they come in the form of homilies, letters, photos, live web cameras operating 24/7, news reports, messages, video (live and recorded) and tweets, to name a few media outlets used. The app will even automatically alert you when an important event is coming up! I just wish that the developers would pay attention to their textual content with the love and devotion and evangelical zeal that it deserves, that we deserve.